It's A Dan's World: NOW THAT'S A SPLASH PAGE: That You Zabu? NOW THAT'S A SPLASH PAGE: That You Zabu? Splash pages - you gotta love 'em. A place where the penciller can hit the reader full-throttle, with a large dose of illustrated 'wow'. While lots of classic splashies feature Batman, Wolverine or the Hulk, sometimes the best little doozies come when the artist gets a whole page to devote to a 64th tier character they are a bit freer to interpret. 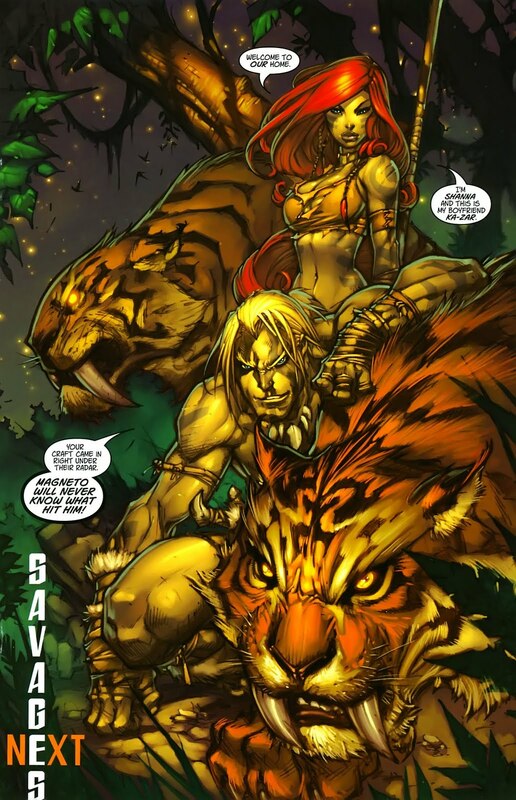 Like say Joe Madureira with Ka-Zar and family. Marvel's 'Lord of the Savage Land' was one of those characters I used to comb the comic racks for, trying to find his endangered guest appearances. To see him decked out here (from Ultimates 3 #3), by one of the artists who defined late 90's comic art... well it's just wild. I mean look at Zabu - he's massive! Adam Strange, Falcon, the Spectre, I'm sure every 'hit artist' has their own favourite lurking in the back of their employers character library. Maybe studios could put out an annual special, where just for a few pages each artist could take their best underdog for a run - just to see the difference a passionate pencil can make. I would love to see the Publishers take that idea to heart, Dan. It'd be like Solo, or Wednesday Comics only much, much cooler. Could you imagine being able to pick up a comic, even heftily priced, and get George Perez, Art Adams, and Kevin Maguire simply riffing on whatever character they want for 6-8 pages each??! Thanks Doug, glad you liked the idea! I think it would be a great way to get those bumper sized specials back in print to. Mix the modern art with the retro format. This is another title I read a long long time ago - haven't thought of it at all for ages. Gorgeous. I know ToB - it can take a while for Marvel to pull the heroes on the shelf down for a dust off. Black Panther, The Surfer - some of those on the sideline are really starting to have their day again now. Maybe it won't be long before folks like Damon Hellstrom, and Ka-Zar get added to that list!